Timothy Aquilino, 4th year fine arts student, gets a plate of hot food filled from the free breakfast event. 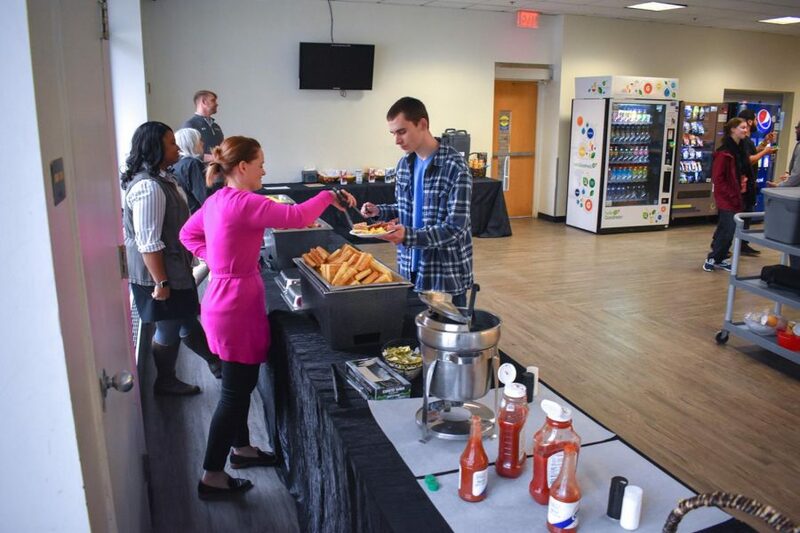 AACC’s Office of Student Engagement gave free breakfast for students to welcome them back to campus on the first day of spring classes. Neena Robertson, the program coordinator for events, helped serve a buffet of waffles, bacon, eggs, coffee, juice and water. Robertson said the hungry students left no extra food behind after the event. “They were good, I was hungry,” Magdaline Thompson, a second-year creative writing student, said about the food. “It’s phenomenal, it tastes really good,” said Darius Green, a second-year culinary arts student. He said he heard about the breakfast from SASP– the Student Achievement and Success Program. “[They] just said to go get some free breakfast before it’s all gone,” Green said. Students can expect more perks coming up as classes start up. CAB, the Campus Activities Board, will hold a Letter Art event on Thursday Jan. 24, in the Careers Lobby from 11-2 and offer free Chick-fil-A in the SUN Dining Hall on Friday Jan. 25 from 12-1.